If you subscribe to this maxim, you should not be spending valuable time focusing on operational issues related to maintaining the Jenkins build infrastructure. Companies such as Riot Games have over 1.25 million builds per year and have written several lengthy blog posts about their experiences designing a complex, custom Docker-powered Jenkins build farm. Dealing with Jenkins slaves at scale is a job in itself and Riot has engineers focused on managing the build infrastructure. As with all technology, the Jenkins build farm architectures have evolved. Today, instead of manually building your own container infrastructure, there are Jenkins Docker plugins available to help reduce the operational burden of maintaining these environments. There is also a community-contributed Amazon EC2 Container Service (Amazon ECS) plugin that helps remove some of the overhead, but you still need to configure and manage the overall Amazon ECS environment. There are various ways to create and manage your Jenkins build farm, but there has to be a way that significantly reduces your operational overhead. AWS CodeBuild is a fully managed build service that removes the undifferentiated heavy lifting of provisioning, managing, and scaling your own build servers. With CodeBuild, there is no software to install, patch, or update. CodeBuild scales up automatically to meet the needs of your development teams. In addition, CodeBuild is an on-demand service where you pay as you go. You are charged based only on the number of minutes it takes to complete your build. One AWS customer, Recruiterbox, helps companies hire simply and predictably through their software platform. Two years ago, they began feeling the operational pain of maintaining their own Jenkins build farms. They briefly considered moving to Amazon ECS, but chose an even easier path forward instead. Recuiterbox transitioned to using Jenkins with CodeBuild and are very happy with the results. You can read more about their journey here. 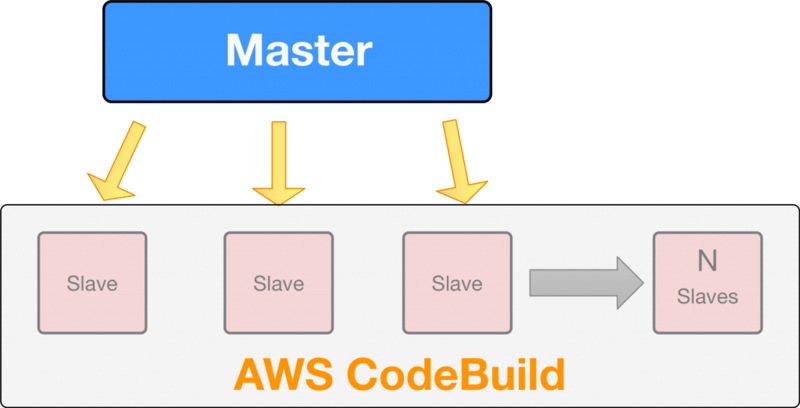 To remove the heavy lifting from managing your Jenkins build farm, AWS has developed a Jenkins AWS CodeBuild plugin. After the plugin has been enabled, a developer can configure a Jenkins project to pick up new commits from their chosen source code repository and automatically run the associated builds. After the build is successful, it will create an artifact that is stored inside an S3 bucket that you have configured. If an error is detected somewhere, CodeBuild will capture the output and send it to Amazon CloudWatch logs. In addition to storing the logs on CloudWatch, Jenkins also captures the error so you do not have to go hunting for log files for your build. 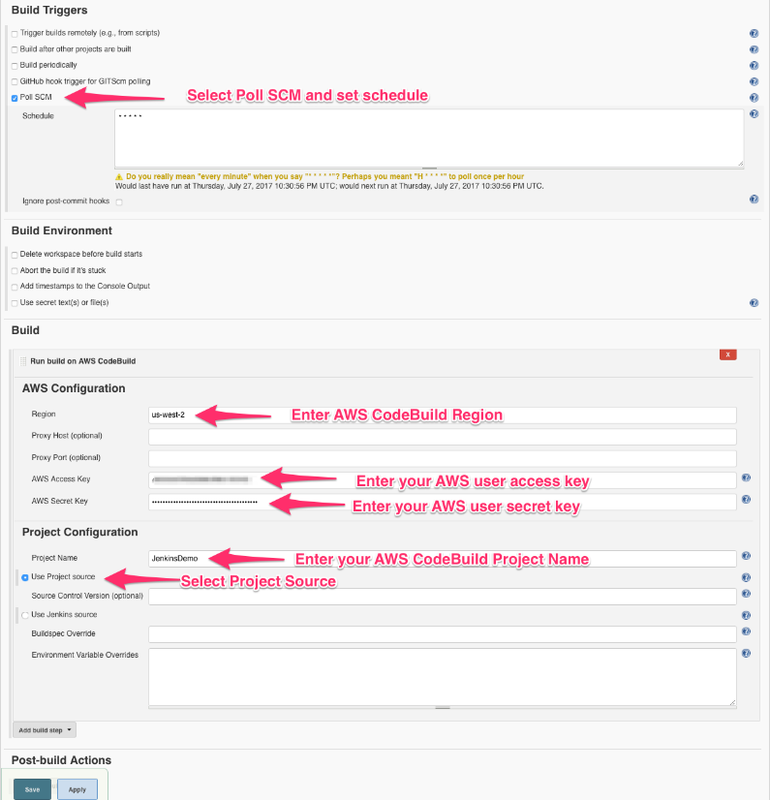 · Amazon S3 bucket for CodeBuild artifacts. · SNS notification for text messaging of the Jenkins admin password. · IAM user’s key and secret. · A role that has a policy with these permissions. Be sure to edit the ARNs with your region, account, and resource name. 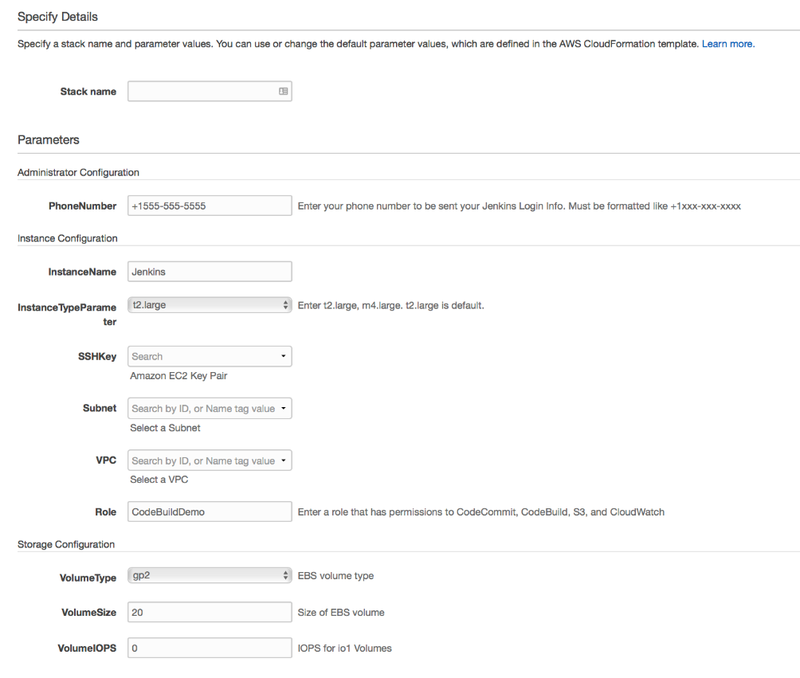 Use this role in the AWS CloudFormation template referred to later in this post. To make the integration with Jenkins as frictionless as possible, I have created an AWS CloudFormation template here: https://s3.amazonaws.com/proberts-public/jenkins.yaml. Download the template, sign in the AWS CloudFormation console, and then use the template to create a stack. After the stack is complete, log in to the Jenkins EC2 instance using the user name “admin” and the password sent to your mobile device. 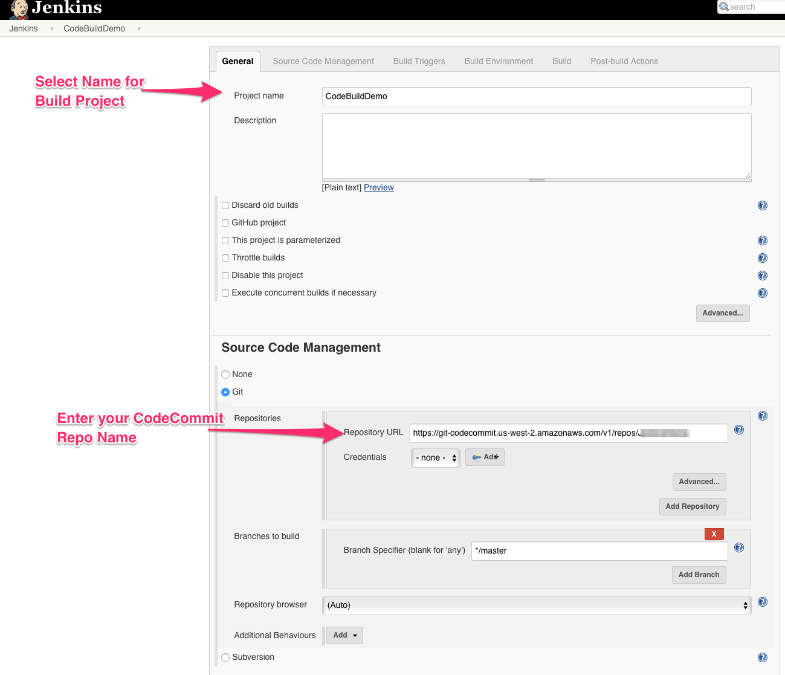 Now that you have logged in to Jenkins, you need to create your first project. Start with a Freestyle project and configure the parameters based on your CodeBuild and CodeCommit settings. In a matter of minutes, you have been able to provision Jenkins with the AWS CodeBuild plugin. This will greatly simplify your build infrastructure management. Now kick back and relax while CodeBuild does all the heavy lifting! 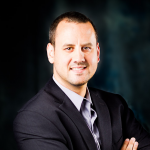 Paul Roberts is a Strategic Solutions Architect for Amazon Web Services. When he is not working on Serverless, DevOps, or Artificial Intelligence, he is often found in Lake Tahoe exploring the various mountain ranges with his family.